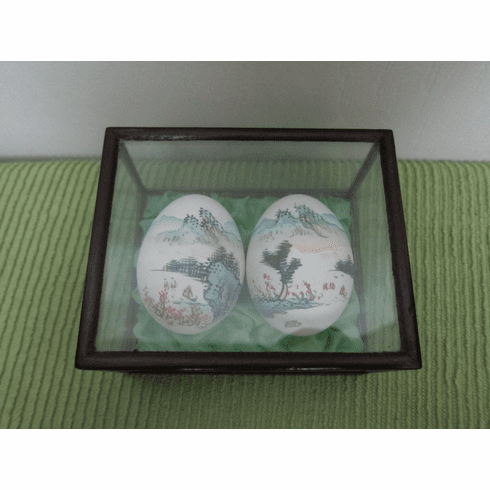 Chinese watercolour landscapes, painted on two eggs. These are probably chicken eggs. The paintings include mountains in the distance, small boats on water, trees and birds. Very nicely done. Both are signed. Size: The lacquer case measures approximately 3-1/4" x 4" wide x 2-1/2" in height. The eggs are approximately 2" long. Condition: Almost perfect! The eggs are fixed in position inside the case. The case does not open. They are sitting on jade green silk. The little wooden case is made to imitate more expensive lacquerware cases. There are no chips or scratches (no scratches worth noting, this is an older piece). The glass is also in good condition - no chips or scratches there either. Please ask for additional photos. More photos are easy to take and even easier to send! Markings: Both paintings are signed. Estate Find. This is the only one that I have. Please Note: This item is listed both here, in this independent online shop and, in my Etsy shop www.RusselAvenueWhimsy.Etsy.com I only have one of these and when it sells from one shop, it will be marked as sold in both shops. I keep a "Wish List" for people who are looking for figurines such as this one. If you would like to be on this list, please send a note and, if I do happen to find the item(s) you are looking for, I will send a note back. Shipping: Please note that this item will need a sturdy box to ship safely in. When choosing a shipping option, please choose the 'Package' option that is best for where you are located. Payment Options: Paypal (your choice of currency) to purchase this item immediately or, choose "Bill Me" and I will send a Square Invoice (Canadian Funds only).